Contrary to manufacturer’s product specifications, the stability over time of monoclonal antibody-based drugs is greater than widely assumed, according to extensive investigations on the effects of different conditions on physicochemical and in vitro properties. Monoclonal antibodies (mAbs) are considered to be a ‘therapeutic revolution’: a new generation of blockbuster drugs that has replaced traditional drugs such as proton pump inhibitors, hypolipodemic agents or antipsychotic drugs . Over the past two decades, mAbs and fusion proteins have provided a breakthrough in the treatment of seriously disabling diseases or otherwise fatal conditions. Therapeutic proteins are also a highly prized treatment for rare diseases, usually severe, for which previous approaches were inefficient. In many cases, however, their use is a last resort for patients. Given the high cost of development, the benefit in terms of cost-efficiency is very limited indeed. Two disease areas are particularly involved: autoimmune diseases and oncology. With regard to the former, mAbs are prescribed by gastroenterologists for Crohn’s and ulcerative colitis, and by rheumatologists and dermatologists for rheumatoid arthritis, ankylosing spondylitis and psoriatic arthritis. The most frequently prescribed products are anti-TNF and the related infliximab, etanercept, and adalimumab. The latter is expected to be the leading pharmaceutical by 2016, exceeding US$10 billion a year in sales. Monoclonal antibodies used in oncology are also likely to reach billions in sales. Bevacizumab, expected to become the second highest product in sales by 2016, is indicated in several types of cancer cells. Rituximab, trastuzumab and cetuximab will also be among the top ten of drug sales. Whereas there were no biotech products among the world’s 10 best-selling drugs in 2000, they are expected to comprise eight of the top ten in 2016, with mAbs monopolizing seven of these. In addition to these gems, other ‘emerging’ antibodies have major financial potential such as ranibizumab, omalizumab, palivizumab, and enosumab; a myriad of new mAbs are also in the pipeline, these products are mainly prescribed by hospital specialists. Although not commonly available in community pharmacies, the financial impact of their use is enormous and is only poorly controlled by third parties such as insurance companies and national social security systems. In Europe, sales of mAbs are growing at 12–15% per year compared to a near zero growth rate for the European economy. The key question, therefore, is how to pay for these new drugs? Besides pharmacoeconomic approaches based on the cost-efficiency ratio for each drug and disease, including modification of prescription guidelines or careful patient-by-patient analysis for each prescription by oncology pharmacists, complementary approaches such as practice optimization may also control costs, including post-licensing studies on the stability of mAbs. Stability studies performed by the pharmaceutical industry are designed only to fulfil licensing requirements [2, 3], with little attention to how these drugs are to be used in clinical practice. Instructions contained in package inserts assume that a drug will be dissolved and administered immediately on a clinical ward. Increasingly, however, the situation for hospital medications may be different. As clinical practice may deviate from licensing requirements we notice a gap between data contained in package inserts, or the SmPC, and practical needs. For example, post-dilution or post-reconstitution stability data are frequently limited to 24 hours solely to prevent bacterial growth, whereas chemical stability could be much longer. In practice, pharmacy-based centralized preparation may have to take place days in advance, with the filling of ambulatory devices for continuous infusions or batch preparations for dose banding. To assume limited stability for expensive products without justification is obviously very costly. Thus, there is a strong need for additional stability data for anticancer drugs. Recently, European guidelines on the stability of anticancer drugs were published under the auspices of the French Society of Oncology Pharmacy, which represents France at ESOP [3, 4]. These include a specific chapter on therapeutic proteins. A review paper on this topic has also been published recently . The main problem is the difficulty of assessing the stability of new biotechnology products such as mAbs . These sensitive products can degrade through a more complex set of pathways than classical drugs due to the various manipulation steps involved in their preparation. The in vivo activity of proteins depends not only on their primary structure (sequence) but also on their structure in 3-dimensional space (secondary, tertiary and quaternary structures). Their protein conformation could change subtly when exposed to mild chemical or physical stresses such as shaking, small temperature change, variations in ionic strength, light, exposure to oxygen or to traces of metals [3, 4]. Monoclonal antibodies (mAbs) have good stability compared to other proteins. Indeed, immunoglobulins are normal constituents of the blood and their natural half-lives are about 3 weeks in what may otherwise be thought of as unfavourable conditions (37°C in the presence of degrading enzymes). In support of this, the half-life of bevacizumab in vivo is also 3 weeks. It is therefore reasonable to assume that an unopened vial of bevacizumab, accidentally stored for 1–2 days at room temperature, will not be significantly altered. However, according to the manufacturer’s recommendations, stocks should be discarded if the cold chain becomes interrupted, in the case of refrigeration failure over a weekend, this is a very expensive waste! Thus, regardless of the financial interests of pharmaceutical companies and to provide hospital pharmacists with a scientific basis for avoiding this costly practice, our team has, over several years, developed a research theme on the stability of mAbs. Initially, we studied the thermal stability of diluted bevacizumab and cetuximab and found no alteration even after 3 months at 37°C . These results encouraged us to investigate further this exciting and largely unexplored area. Protein instability implies two main types of alteration with several possible pathways: (i) physical instability: aggregation, denaturation or adsorption on surfaces; (ii) chemical instability: desamidation, disulfide bond breakage, hydrolysis, isomerisation, non-disulfide crosslinking, or deglycosylation. The main causes of instability include temperature (elevation or freezing), formulation pH, adsorption, salt effects, oxidation (associated with metal ions and chelating agents), shaking or shearing and concentration. Many of these conditions can be found during the handling process in the pharmacy or on the ward. Unexpected instability can be induced very subtlety by simple processes such as stirring or filtration due to substances that can leach from the surfaces of filters or syringes [6, 8]. Stability assays for therapeutic proteins must therefore involve several specific studies and represent a considerable analytical challenge. For a complete stability profile, several complementary (orthogonal) methods are necessary including at least three complementary separating methods . A good stability study also requires stressed conditions to ascertain the relevance of the chosen analytical methods. For tests on proteins, these should include not only high temperature stress but also low temperature conditions such as freezing. This can trigger instability not through chemical alteration but by physical processes such as aggregation, which is unlikely with classical low molecular weight drugs. Mechanical stress can also induce aggregation. For example, we have found a new commercial formulation of the drug cetuximab to be less sensitive than the old formulation to the effect of mechanical stress (stirring) owing to the presence of a tensioactive agent . We have also studied the influence of pneumatic conveying systems on the stability of diluted rituximab in polyolefin bags. With as many as eight circulations through the system, and without introducing air, there was no modification in comparison with a control (no circulation). However, in presence of air, we found clear modifications after four routes. We concluded that, in practice, the pneumatic system can be used for the transport of proteins but the introduction of air into the bags promotes instability . Theses results imply that, in the case of delayed or cancelled administration, a rituximab bag can be safely returned to the pharmacy and returned to the ward by the same conveyancing system. Theses results are critically important since up until now, many pharmacists have been instructed by their respective inspection bodies to discard unutilized bags, with obvious cost consequences. As our clinicians accept the use of dose-banding for some mAbs such as rituximab, we currently prepare batches of this mAb in advance (700 mg and 600 mg per 500 mL bag) under GMP conditions (ISO 5) that give assurance of bacteriological quality and permit full analytical control of each batch. This practice is based on our long-term stability study demonstrating that bags kept at 5°C ± 3°C were chemically and physically stable for more than 6 months . Various protein characterization methods were used to assess possible changes in physicochemical properties, including size-exclusion and cation-exchange chromatography, dynamic light scattering, turbidimetry, thermal denaturation curves, second-derivative ultraviolet and infrared spectroscopy, and peptide mapping. 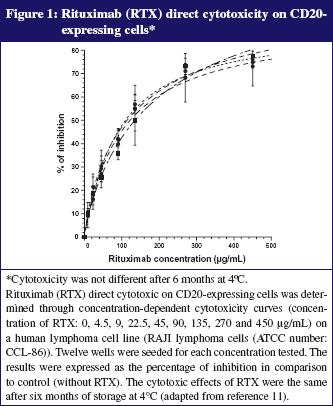 We have also demonstrated that the biological activity of rituximab was fully conserved (toxicity on anti-CD20 expressing cells). A complementary study under stressed conditions (storage at 40°C) showed that all methods employed were appropriate for indicating stability. Typical results are presented in Figures 1 and 2. The savings per year due to dose-banding may appear modest, but they are significant, considering the total purchase cost of purchasing rituximab: we saved about 2%, or Euros 50,000 from a total of Euros 3,000,000 and about 150 work hours of technicians. We should also consider improvements in the quality and safety of prepared bags, better workload organization and reduced treatment delays for patients, all benefits that are difficult to quantify in financial terms. A recent German study showed that reconstituted trastuzumab was stable for up to 1 month . However, this result confirmed the manufacturer’s stability data only with regard to reconstitution with bacteriostatic water, while the same product reconstituted with water for injection is said only to be stable for 48 hours . Even if expected, these results clearly demonstrate that the manufacturer’s proposed stability limit was based on the risk of biological contamination rather than physicochemical stability, as found previously [2–4]. However, to investigate the potential for dose-banding with trastuzumab, we performed a detailed long-term stability study demonstrating that diluted trastuzumab (0.8 and 2.4 mg/mL in saline in polyolefin bag) is strongly physicochemically stable up to 6 months at 4°C . This extended stability could enable advance or batch preparation by pharmacy centralized units. Such long-term stability data are required for the development of a dose-banding approach to mAbs, underscoring the importance of further high quality research in this field. In conclusion, our results demonstrate that the time frame for the use of mAbs in oncology can be extended safely, allowing, for example, early reconstitution, workload optimization or safe storage of a patient’s bags for several days. Our results also support the possibility of preparing standardized batches of ‘ready-to-use’ diluted mAbs according to good manufacturing procedures that ensure sterility and quality control. We have demonstrated that extending the anticipated stability time limit of mAbs can help pharmacists to maximize cost-efficiency even if the benefit appears modest. The more that a dose-banding approach is taken with mAbs, the more financial benefits can be gained. Even just retaining unused bags, or the use of already opened vials for several patients, will have a significant impact. 1. Gerard PE. Biosimilaire d’anticorps monoclonaux: un avenir incertain? Biotech Finance. 2011;521:6-8. 2. Astier A. The stability of anticancer drugs. Eur J Oncol Pharm. 2007;1(1);21-3. 3. Bardin C, Astier A, Vulto A, Sewell G, Vigneron J, Trittler R, et al. Guidelines for the practical stability studies or anticancer drugs: a European consensus. Ann Pharm Fr. 2011;69(4):221-31 and Eur J Hosp Pharm. 2012;19:278-85. 4. Astier A, Pinguet F, Vigneron J, Arnaud P, Bellanger A, Bonan B, et al. The practical stability of anticancer drugs: SFPO and ESOP recommendations. Eur J Oncol Pharm. 2010;4(3):4-10. 5. Astier A, Paul M. Practical stability studies or therapeutic proteins in oncology. Hosp Pharm Eur. Forthcoming 2012. 6. Manning MC, Chou DK, Murphy BM, Payne RW, Katayama DS. Stability of protein pharmaceuticals: an update. Pharm Res. 2010;27(4):544-75. 7. Paul M, Lahlou A, Carvalho M, Blanchet B, Astier A. Thermal stability of two monoclonal antibodies: cetuximab and bevacizumab. Eur J Oncol Pharm. 2008;2(1):37. 8. Paul M, Vielillard V, Roumi E, Cauvin A, Despiau MC, Laurent M, Astier A. Long-term stability of bevacizumab repackaged in 1 mL polypropylene syringes for intravitreal administration. Ann Pharm Fr. 2012;70(3):139-54. 9. Hawe A, Wiggenshorn M, van de Weert M, Garbe JHO, Mahler HC,Jiskoot W. Forced degradation of therapeutic proteins. J Pharm Sci. 2012;101(3):895-913. 10. Lalou A, Blanchet B, Carvalho M, Paul M, Astier A. Mechanically-induced aggregation of the monoclonal antibody cetuximab. Ann Pharm Fr. 2009;67(5):340-52. 11. Vieillard V, Rilcy K, Magneux C, Bellanger A, Astier A, Paul M. Pneumatic conveying systems and physical stability of monoclonal antibodies: example of rituximab. Abstract n° 85. ECOP; 2012 Sep 27–29; Budapest, Hungary. 12. Paul M, Vieillard V, Jaccoulet E, Astier A. 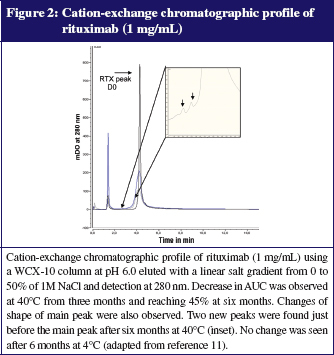 Long-term stability of diluted solutions of the monoclonal antibody rituximab. Int J Pharm. 2012;436(1-2):282-90. 13. Kaiser J, Kramer I. Physicochemical stability of diluted trastuzumab infusion solutions in polypropylene infusion bags. Int J Pharm Compound. 2011;15(6):515-20. 15. Vieillard V, Da Silva R, Astier A, Escalup L, Paul M. Physicochemical stability of diluted trastuzumab solutions stored 6 months at 4°C. Abstract n° 91. ECOP; 2012 Sep 27–29; Budapest, Hungary. Submitted for publication in Int J Pharm.